The region of Florida s Central Gulf Coast has always been popular amongst retirees and continues to remain a favorite destination as it offers lower than average prices, a beautiful climate and endless opportunities for entertainment and recreation. Many of the people that choose this region for retirement are moving from the Midwest. As a result, the area seems to adhere to more conservative Midwestern values in terms of architecture, congestion and lifestyle as opposed to the more heavily populated Atlantic coast of Florida which seems to be favored by New Englanders. Some of the most popular active adult communities in the Central Gulf Coast area include Sun City Center, Kings Point, and Timber Pines. The climate is a big draw for many of the active adults that settle in the area. The climate of this region is generally slightly warmer and less humid in the summer and cooler in the winter than the Atlantic coast. The weather in the Central Gulf Coast is generally the same throughout the region with the exception of areas farther inland not being as tempered by the Gulf as the coastal parts. As a result, places farther from the ocean tend to be hotter in the summer and cooler in the winter. Average July temperatures range from a low of 68 to a high of 84. Winters are especially comfortable as January highs usually top out at 70 and nighttime lows rarely drop below 50. The area experiences approximately 45 inches of rain annually. The Central Gulf Coast is comprised of two distinct regions. The northern section, consisting of Citrus County, Hernando County and Pasco County, is an area of low-lying gulf coast made up of a patchwork of rivers and marshes. There are no barrier islands along the coast and, as a result, beaches are rare. Farther inland, the low-lying land rises to form beautiful rolling hills and lakes. 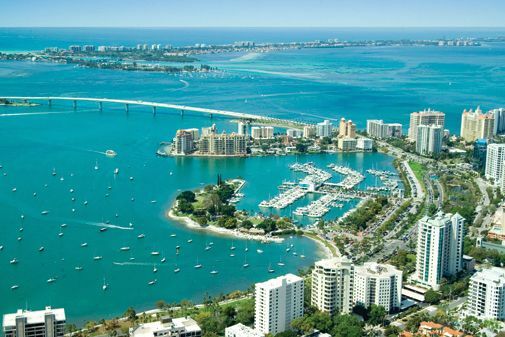 The southern section of this region, consisting of cities like Clearwater, Tampa, St. Petersburg and Sarasota, is protected by barrier islands. The area is home to some of the most beautiful beaches in Florida. Most of the active adult communities here are close to the ocean or situated around Tampa Bay. The Central Gulf Coast area offers an abundance of recreational opportunities for active adults. The Tampa Bay and St. Petersburg areas are home to several concert halls and performing arts centers. There are a number of art galleries in the region, such as the John and Mable Ringling Museum of Art. In addition, the Crystal River State Archaeological Site and Museum provides a glimpse into the regions history. The beaches of Clearwater, Sarasota, Bradenton and St. Petersburg are among the most scenic in all of Florida. Residents of the area enjoy the fishing, snorkeling, diving and golf that the area has to offer. Plus, there are several pro sports teams in the region and several Major League Baseball teams that temporarily reside in the area for spring training. When the grandkids come to visit there are a number of great destinations in the area, such as Homosassa Springs State Wildlife Park where you can watch manatees swim from an underwater viewing room. Plus, the region is home to Busch Gardens, Florida Aquarium and numerous water parks. In addition, Orlando and its many attractions are only an hour away. Active adults who settle in this region experience a slightly lower cost of living than the rest of Florida. Home prices here are generally lower than other areas with an median price of $115,000. With no individual income tax and a 6% tax on goods sold, active adults in the area can live here without the worry of financial burden. Active adults who choose to settle in the Central Gulf Coast area enjoy knowing they are surrounded by great medical services. Tampa and its surrounding suburbs are home to more than 20 hospitals and four trauma centers. US News and Word Report named three of the hospitals in the area among America s Best Hospitals .